Kenney Mencher: These are not the Arnolfini. This painting is important because it is one of the earliest paintings to be made with oil paint. Previously to this, paintings were usually made either with egg tempera or were fresco on plaster walls. This painting was created with an underpainting of egg tempera and then successive glazes of thin transparent layers of color were applied using a mixture of pigments and linseed oil. This technique of using oil paint allows the artist to be able to shade and blend more accurately and realistically. Although linear perspective was being used by artists in Italy, Jan van Eyck does not seem to use a consistent system of linear perspective in his painting. Probably, because the painting is a combination of studies of different objects in the room such as, the chandelier and the mirror. This painting is also important because it is probably titled incorrectly. 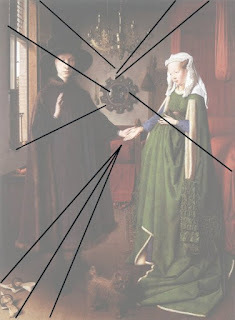 Irwin Panofsky, and art historian in the early to middle parts of the 20th century, base the title “The Arnolfini Wedding Portrait,” on finding an obscure reference to a wedding between two people from Italy wall they were staying in the northern part of Europe known as Flanders. Years later another historian placed the wedding in 1447, 13 years after the date on the double portrait and six years after van Eyck's death. So interestingly enough the analysis of the symbols and the subject matter of the painting by Irwin Panofsky is probably incorrect, however, some historians insist on teaching the older interpretation of this painting. Panofsky’s interpretation of this painting is that it’s a couple getting married in the sacred wedding chamber. The poses of the two individuals indicate that the woman is putting her hand in the hands of her new husband. The bare feet represent that they are on scared ground and this is a sacred event. The placement of the woman near the bed and the man near the window has significance for Panofsky as well in which he thought that it was a representation of what they did as a couple. The wife stayed home near the bedroom, and the husband usually leaves the home and is in a different realm. The chandelier with a single candle has been discussed a lot maybe it’s supposed to represent the light of God. The dog might represent fidelity. The green of the gown could represent spring time and fertility. The woman is not pregnant but the extra amount of material in her gown is held up against her stomach and at a glance could be mistaken for the stomach of a pregnant woman. 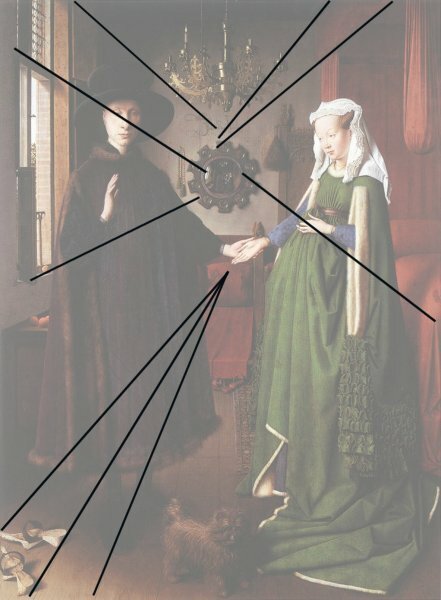 The mirror in the background contains the back of the two figures and the artist who is painting the couple’s portrait, the reflection combined with the inscription that translates “Jan van Eyck was here.” for Panofsky this could be interpreted as Jan van Eyck witnessing the wedding contract. The above interpretation is probably incorrect since it is based on incorrect information. An alternative theory of what the painting means is that the painting represents a kind of scene of everyday life called by art historians as a “genre scene.” It is possible that it is a kind of sarcastic statement about wealth and morality. That the scene might be an indictment of the wealth of some Renaissance businessmen. The obvious wealth of the clothing, furniture and other items, even the dog is a type of “toy” dog and might be just a rich person’s plaything.